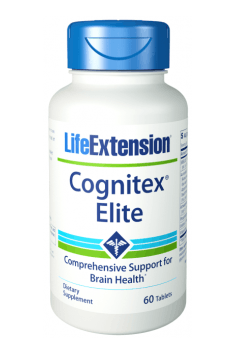 Life Extension Cognitex Elite is a dietary supplement supporting brain power and improving cognitive functions. This preparation provides natural and effective ingredients with scientifically proven effect. Thanks to them, the brain is more efficiently supplied with nutrients, whereas nerve cells can function at the highest speed. This happens, among others, by stimulating neurons to produce neurotransmitters and providing a better blood supply to the nervous tissue, which results in better memory, concentration, mental acuity and many other benefits. Sage Extract is an extract from sage leaves – a plant that, due to the large amounts of health-promoting substances contained in it, has been used for thousands of years to alleviate various ailments. The beneficial substances include, among others, cineol, camphor, numerous vitamins, and flavonoids. They are responsible for improving the health condition, for example, in the case of colds, fever or constipation. As it turns out, the sage extract also provides a pool of compounds that positively affect the functions of the central nervous system. It promotes the correct concentration and use of neurotransmitters such as acetylcholine, GABA, dopamine, and serotonin. Studies have shown that people using sage extract have a better frame of mind and concentration. Besides, the compounds contained in sage leaves improve long-term memory, blood flow in the brain, expression of genes responsible for lipid metabolism and insulin signaling pathways. What's more, Sage Extract provides 2.5% of rosmarinic acid, which is characterized by neuroprotective effects. It is an inhibitor of enzymes responsible for the synthesis of compounds that lead to inflammation and prevents from platelet clumping. Thanks to this, it protects nerve cells and may reduce the formation of clots leading to local ischemia. Interestingly, due to its antioxidant and anti-inflammatory properties, and the ability of preventing the decomposition of acetylcholine, rosmarinic acid may potentially support the treatment of Alzheimer's disease. Wildberry complex is a set of four berry species providing valuable antioxidants. They are of key importance in the inhibition of inflammatory factors in the nervous tissue that are responsible for the negative effect on memory. These antioxidants may also delay the occurrence of some neurodegenerative diseases and make us enjoy a sharp mind, regardless of age. Ashwagandha extract is an extract from a shrubby plant also known under the name of Indian ginseng. It has adaptogenic properties due to the presence of withanolides, which comprise as much as 10% of the extract content. The extract has the ability to stimulate the growth of axons and dendrites – nerve cell protrusions that form the connections between them called synapses. It also improves mood, memory and facilitates adaptation in stressful situations. Some sources report that ashwagandha may slow down the formation of beta-amyloid in the brain, delaying the onset of Alzheimer's disease. Phosphatidylserine is an essential component of cell membranes of neurons and other structures. It is responsible for the efficient communication of cells and the formation of synaptic connections between them, which results in more effective information exchange, improvement of memory, concentration and the ability to extend the attention span. In addition, phosphatidylserine mediates the more efficient use of energy sources in the brain, which facilitates its more efficient functioning. Uridine-5'-monophosphate (UMP) is a nucleotide consisting of uracil, ribose, and one phosphoric acid residue. It is part of nucleic acids – RNA and DNA, which is why it is essential for the synthesis of proteins, including those that function as neurotransmitters. UMP in the central nervous system is therefore responsible for the increased synthesis of dopamine and acetylcholine, as well as phosphatidylcholine, which improves the functioning of synapses. UMP also activates the neural growth factor responsible for the increased differentiation of nerve cells, which may be manifested by a more efficiently functioning nervous system and the development of new connections between neurons. Vinpocetine is an alkaloid obtained from Periwinkle, which has a beneficial effect on the nervous system by improving its blood supply. This compound is also used as a drug after stroke, in the treatment of atherosclerosis or retinal diseases. Vinpocetine, by relaxing blood vessels and improving the elasticity of erythrocytes, enhances blood circulation in the brain. As a result, erythrocytes more easily squeeze through the capillaries and reach the nerve cells. This, in turn, facilitates the transport of oxygen and glucose to neurons, which are the key compounds for efficiently functioning metabolism of the nervous tissue. On the other hand, oxygen and glucose are used for greater production of ATP, which is necessary, for example, in the synthesis of neurotransmitters responsible for the transmission of information within neurons, as well as the process of memorizing and for the improvement of many other phenomena occurring in the brain. In conclusion, Life Extension Cognitex Elite is a dietary supplement that provides valuable ingredients that improve the functioning and health of the nervous system. The use of this preparation will improve cognitive functions – memory, concentration, mental acuity. The natural ingredients contained in this product also contribute to better nutrition of the brain through the improved circulation in the nervous system and better transport of nutrients. Microcrystalline cellulose, croscarmellose sodium, maltodextrin, silica, stearic acid, aqueous film coating (hypromellose, glycerin, purified water).